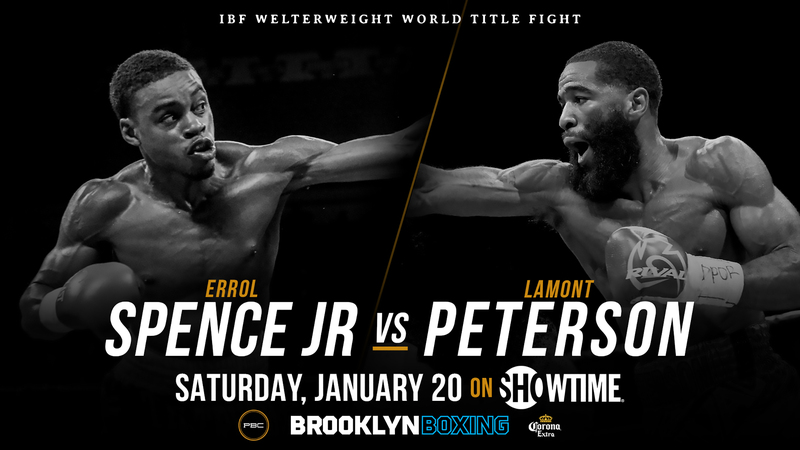 Rising stars and veteran contenders will enter the ring on Saturday, January 20 looking to start their 2018 with a statement victory when they compete in undercard action from Barclays Center, the home of BROOKLYN BOXING®, on the undercard for the welterweight championship showdown between IBF champion Errol Spence Jr. and two-division champion Lamont Peterson. Undefeated 135-pound world champion Robert Easter will defend his IBF Title against former world champion Javier Fortuna in the co-main event live on SHOWTIME (9 p.m. ET/6 p.m. PT). In the SHOWTIME CHAMPIONSHIP BOXING PRELIMS, unbeaten light heavyweight Marcus Browne will take on once-beaten Francy Ntetu in a 10-round fight and undefeated heavyweight sensation Adam Kownacki will face Iago Kiladze of Kiev, Ukraine in a 10-round bout. The live digital offering will stream exclusively in the U.S. on the SHOWTIME Sports YouTube channel and the SHOWTIME Boxing Facebook page. “This fight can definitely set a good tone for me in 2018. I’m going to be making a statement with this fight. My last three fights I haven’t gotten a knockout. I’m going to be giving my fans and fight fans a good show. “I’m going to use my reach and length and destroy this guy from the outside. All my career I’ve been fighting shorter guys. Every short guy doesn’t fight the same. But you get in the ring and you feel him out and make adjustments. “There’s nothing in particular that I have to prepare for with Fortuna. I take every fight the same. Every fighter fights different so you get in there, feel him out and make adjustments as you go along. I’m not worried about him being a southpaw. I’ve faced plenty of lefties in my career and in the amateurs. That’s no problems at all. “I think what makes me the more dangerous boxer in this fight is having the height that I do and the punching power and the speed and the mindset as well. My mindset is that I’m not going in there to play around with him. I’m ready to destroy. “My preparation for this fight is going very well. I’ve been working out in the Dominican Republic, but I’ve come back to Boston to finish my training. Right now we’re at 75% and closing in on 100%. I will be completely prepared when it’s time to fight. My preparation and my strategy make me the more dangerous guy. “I see this like no other fight that I’ve had before, because every opponent is different. Everyone has their own niche at this level, something that works for them. His niche is that he’s tall. He uses that to his advantage. But it’s nothing that I can’t overcome. I’ve fought tall guys before. “My opponent (Francy Ntetu, 17-1, 4 KOs) looks like a durable, tough guy. I see this fight being very exciting for the fans for as long as it lasts. I saw a little bit of tape on him. I know he always comes in tip-top shape, and I hear he’s consistent in his performance in the ring. I just know I’m going to have to be sharp on Jan. 20. “It’s always an honor to fight here at home and at Barclays Center. It’s special to be able to perform in front of these fans and I can’t wait to put on a good performance leading up to the Spence vs. Peterson fight. “This fight could put me in the position that I need to be in to fight for a world title. I can’t be lacking in any way. I have to come out strong with a great performance from start to finish and leave no doubt in there. “I know Marcus Browne is probably taking me lightly and thinks he will simply go through me. I hope that’s the case, because it’s going be a shock to him, the fans and his team when I take his spot in line for a title. I want to face Eleider Alvarez in our hometown of Montreal after I get this win. “My previous fight at Barclays Center against the current WBC champion David Benavidez was obviously a very bad decision by the referee to stop the fight, especially when I was winning the round and Benavidez was slowing down. I was getting stronger while he was getting weaker. “This fight is going to be another step toward becoming a champion. I know I’m going to have to work very hard and prove that I’m continuing to build on my win against Szpilka. From the video I’ve seen on Iago Kiladze (26-1, 18 KOs), he moves a lot, so I’ll be needing to cut off the ring. Whatever he brings to the ring, I’ll have an answer for. “Three years in a row now I’ve been fighting in January. I love starting off the year strong. My wife and I actually started a tradition of the “Kownacki Family Run” at midnight on New Year’s Eve. Since I’m always preparing for a fight around New Year’s, we figured we might as well have fun while we work. So, we’ll have some friends come out and run a few miles with us around the neighborhood during the fireworks. It’s fun and helps get me ready. “I feel great and my training has been terrific. My trainer is Freddie Roach now. I sparred with (IBF Cruiserweight Champion) Murat Gassiev three times recently which is great preparation for me. I believe I can knockout Kownacki but if I have to go the distance I’m prepared for that. Either way, I’ll be victorious. I’m feel that I’m the more skilled fighter and that will show in the ring. “This is a great fight for my career and a terrific start for 2018. I know that if I win this fight I’ll be that much closer to a world title opportunity.